I've started teaching a series of watercolour classes in my home studio. I look forward to every class as it is so energizing to share watercolour with other lovers of the medium. This class is a departure for me; previous classes were centred on learning technique by creating paintings step by step together, which was great for a realistic style. However, I don't paint with the goal of realism anymore, so why would I teach that way? We've been working instead on learning watercolour by painting loosely, and it's been great fun. Last week we started a landscape painting and then spent the rest of class working on a floral. When I'm demonstrating to a class, I find the best way to show them my work as it happens is to hold the painting board propped against the table, and paint from behind - essentially painting upside down. Because I do a lot of talking and explaining the process, I find that most of the time, these paintings don't turn out to be anything but good examples for demonstration. But every now and then, one of them turns out to be something I love and believe to be worthy of framing. "Dainties" is a delight. I love the freshness of the colour and the brushmarks. It's a tribute to the power of suggestion in painting - that objects don't need to have every detail defined to be beautiful and make evident what they are. And I always believe that loose paintings like this reveal the beauty of watercolour - the fluidity, transparency and movement that can only be found in watercolour and that I love so much. "Dainties" measures 8 1/2" x 11 1/2" and is available for purchase. 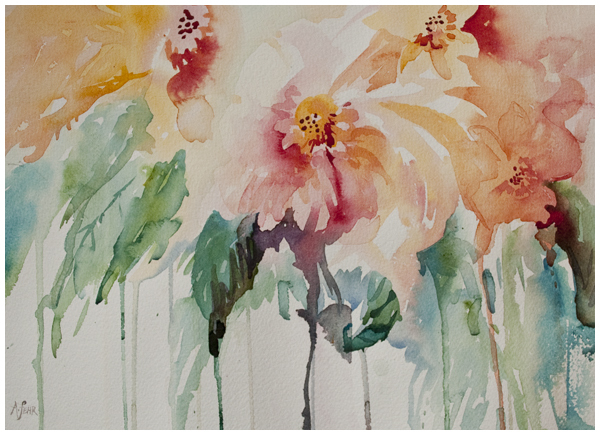 You can take my online class on painting florals loosely here.